‘Lucifer’ the Mohanlal starre film has created a history in the Malayalam film industry by entering the 100 crore club. The film has entered the 100 crore club in just eight days after its released. The film which marked the directorial debut of actor Prithviraj is a dark-shaded political thriller. The film penned by actor Murali Gopi has received wide acclaim from both critics and audience. The makers of the film has shared the news that the film has crossed the prestigious benchmark through social media. Director Prithviraj and production house Aashirvad has shared their happiness with the audience. This is the third Malayalam film entering the 100 crore club. And also Mohanlal’s third Malayalam film entering the club. EEarlierPuli Murugan and Kayamkulam Kochunni has entered the 100 crore club. 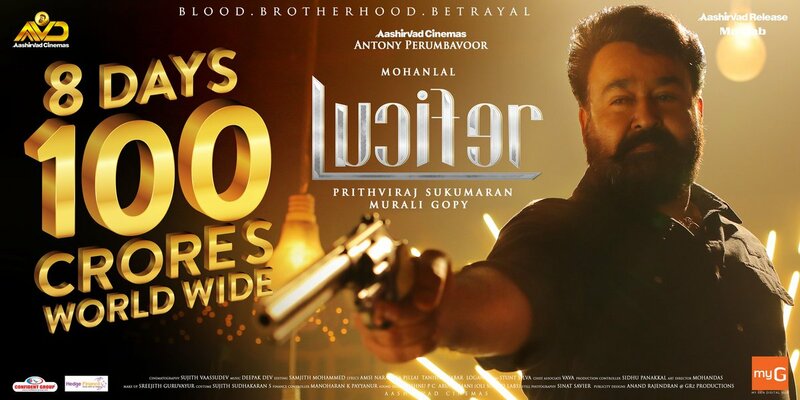 Lucifer has already breaked many box-office records globally. The film has become the highest grosser in almost all aeas it released.